A "highly aggressive" bull in New Jersey went berserk, attacking its owner and charging at police officers after it got out of its enclosure. Officers got several calls about a cow approaching cars on Houses Corner Road in Sparta around 3 p.m. on Friday, Sparta Township police said on Monday. One of the calls was from the animal's owner, who told police the cow was actually a bull, and said the animal had been acting “highly aggressive” recently. 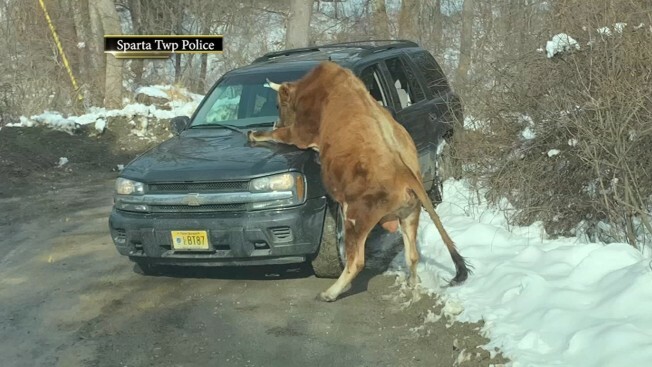 When Sparta Police Officer Arlene Lippencott got to Houses Corner Road, the bull’s owner was already at the scene in her own car, police said. The bull initially started following his owner's car up a gravel road toward the farm, but soon began bumping against the car and trying to mount it, according to police. When the owner arrived at the farm, she got out of her car and tried to get the bull to go through a gate and back into its enclosure, at which point the bull started attacking her and throwing her around, police said. “[The owner] was screaming that the bull was going to kill her and needed to be shot,” police said. Officer Lippencott tried to distract the bull and managed to get the woman into her police car, at which point several other officers and EMS arrived at the farm, according to police. Two other officers put the bull down after it charged at their police car, the department said. The bull's owner was taken to the hospital, where she got stitches on her head and was treated for lacerations and bruises on her upper body, police said. She told police the bull had recently attacked her husband, but said that attack hadn’t been as serious.